Now that the winter season is here, many pool owners have closed their pools for the year. Others are asking themselves (and us!) if a pool heater is worth the investment. As pool care pros, we are asked about pool heaters often. There are several factors which determine the type of heater which might work in your situation. How often do you use the pool? Today, we’re going to talk about some of the different types of energy used by pool heaters, and what kind of situations could make those applicable options. Solar is probably the option which Arizonans will consider first, but the panels, which can be unattractive, have to be in the sun most of the day. The area of the panels needs to be between 50-100% of the pool surface area to be effective. Water quality will affect the longevity of a solar pool heater. Solar heating for a pool runs between $3-4k but lasts a bit longer than other options. It also costs virtually nothing to run. 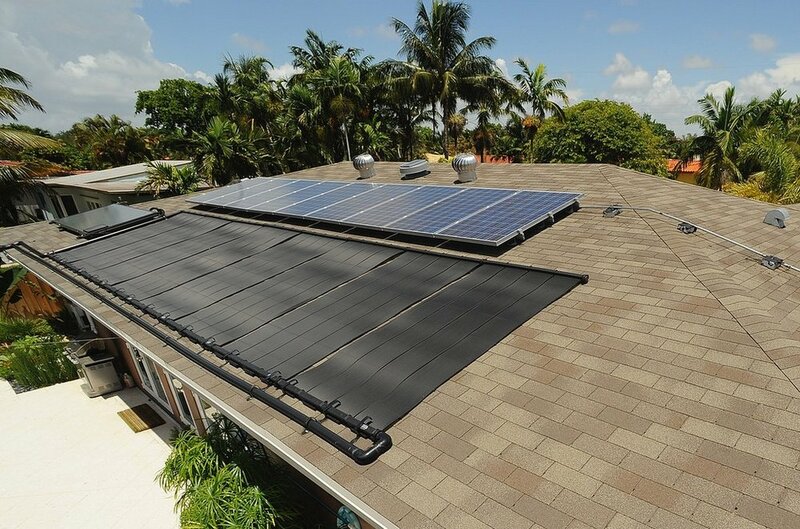 But, the orientation and tilt of the panels will determine the effectiveness of the solar performance. Natural gas or propane gas is a little pricier than a heat pump to run, but heats the water quickly, for example, for weekend swimmers. One of the complaints about gas, besides availability and dependence on the price of gas, is that it’s easy to wander inside and forget to turn the heater off. If you have natural gas in your area, the cost to run a gas pool heater will be determined by the price you pay for your natural gas. Propane gas heaters require a tank which will have to be periodically refilled at the going rate. Electric costs more than a gas heater to run. It heats the water via electricity, more slowly, so it’s best for people who will often swim, not just on weekends. Electric resistance is the least efficient method of heating a pool. The initial capital outlay for a pool heater, regardless of which option a homeowner chooses, is going to be hefty. It will add value to the pool, but, like any appliance, has a lifespan. Because of factors such as cost, availability of gas, etc., sometimes the option of a solar bubble blanket cover is regarded as a solution without a lot of capital outlay. However, bubble blankets tend to die a moderately fast death from sun rot, usually within one to three years. Sadly, the higher quality blankets don’t heat as well.